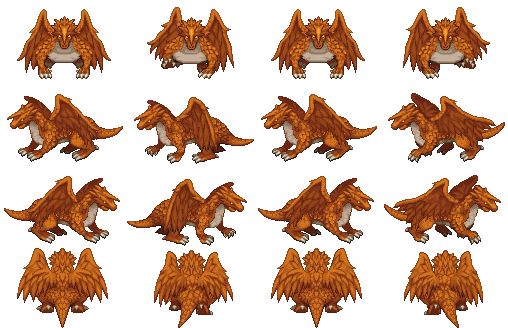 As stated in this thread, over the years I've found some good dragon sprites on the web, but none of them were exactly what I was seeking. There is one by Famikawe on Deviantart (and it's prior form), that was the nearest to my own idealization, since it's a true piece of art, but can't be used commercially. So I set out to make my own version, using the Rtp's "099-Monster13" as base, and below is the resulting character. You must give credit to Vickarius (or LordVickarius, my other alias). As soon as I can, I'll try to do some recolors of this one and update this thread, so stay tuned! Any suggestions are welcomed. Mainly a certain werewolf (DerVVulfman), by his suggestions about the size of the wings, length of the dragon, and overall support.